Trying to give Smokehead a chance…. So we tried Smokehead once before – the Rock edition. To say that it didn’t impress the Whisky Ladies is putting it mildly. While we are always curious to try different things and no strangers to peat, ashtray is generally not our preferred style. However when approached by the folks over at Ian MacLeod distillery suggesting their standard Smokehead is more accessible than the Rock edition, I didn’t have the heart to refuse their rather sincere representative, though did warn him our tasting would be unbiased and honest. The little Smokehead mini sat patiently waiting for many months until finally one evening it was time to try a range of peat whiskies. Thus was born the evening of minis of a peaty persuasion – Peat Chimney 12 year 40%, Big Peat 46%, Longrow 46%, BenRiach Peated Quarter Cask 46%, Ledaig 10 year 46.3%. Smokehead came along for the ride but the others politely but firmly declined. What to do with our poor rebuffed Smokehead sample? Try try try again… finally a fateful evening occurred when Smokehead finally was cracked open. Our conclusion “All talk, no action”… in other words the nose was more promising than the palate. Full disclosure – this sample was provided by the folks at Ian McLeod. 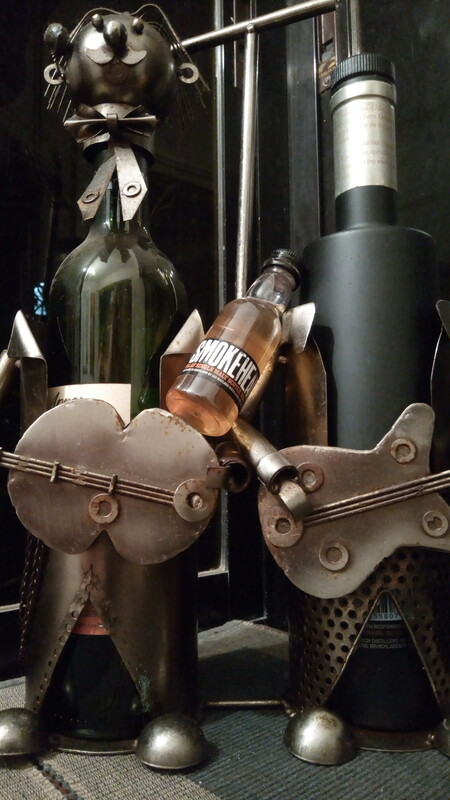 This entry was posted in Islay, Scotland and tagged Islay, Peat, Smokehead by Carissa Hickling. Bookmark the permalink.